You Wu, cofounder of PipeGuard, delivered his pitch to Demo Day judges (left to right) Holly Maloney McConnell, Steve Pagliuca, and Miceal Chamberlain Jr.
PipeGuard Robotics, a local startup that uses robots to navigate water pipelines in search of leaks, beat out more than 100 other startups Saturday to take top prize in HUBweek’s Demo Day Pitch Competition at City Hall Plaza. The group took home a grand prize award of $20,000, as well as a slew of other prizes in the second annual edition of the competition. “The money is super appreciated,” said Jonathan B. Miller, a cofounder of PipeGuard Robotics. The Demo Day Finale, which ultimately handed out more than $150,000 in prizes, was the culmination of a daylong event celebrating the state’s bustling startup scene. Earlier in the day, 100 startups packed City Hall for a showcase of the state’s bustling startup scene. There, the public had the opportunity for an up-close look at some of the innovative things going on in and around Boston. Of those, six semifinalists were selected to give short presentations Saturday afternoon to a three-judge panel that included Miceal Chamberlain, Bank of America’s Massachusetts market president; Steve Pagliuca, cochair of Bain Capital and co-owner of the Boston Celtics; and Holly Maloney McConnell, managing director of General Catalyst. Each startup was given a few minutes to present a brief overview of its work, followed by a short question-and-answer session with the judges. Over the course of an hour, meanwhile, judges and audience members heard from a wide-ranging collection of startups. There was Best Bees, a beekeeping service that collects data on bees using so-called “smart-hives.” There was a company called Tactile, which presented a device that translates text to Braille in real time. And there was TellusLabs, a group that presented a global surveillance system for agriculture. It was PipeGuard Robotics, though, that ultimately earned the judges’ favor. During a short presentation, You Wu, another cofounder, outlined the significant costs of water leaks — by his figures, Boston could spend about $10 million annually as a result of water leaks — and described his company’s product, a device that uses sensors to detect early leaks in pipes, as a way to save millions of dollars in infrastructure damage and property repairs. “We can [identify] leaks when they are small rather than when they grow into a catastrophic event,” Wu said during his presentation. The prize money, Wu said, will go toward cloud platform building. The runner-up award went to Twiage, a startup that allows ambulance paramedics to use an app to transmit vital information — including photos, videos, and EKGs — to emergency room nurses as a way to save precious time. 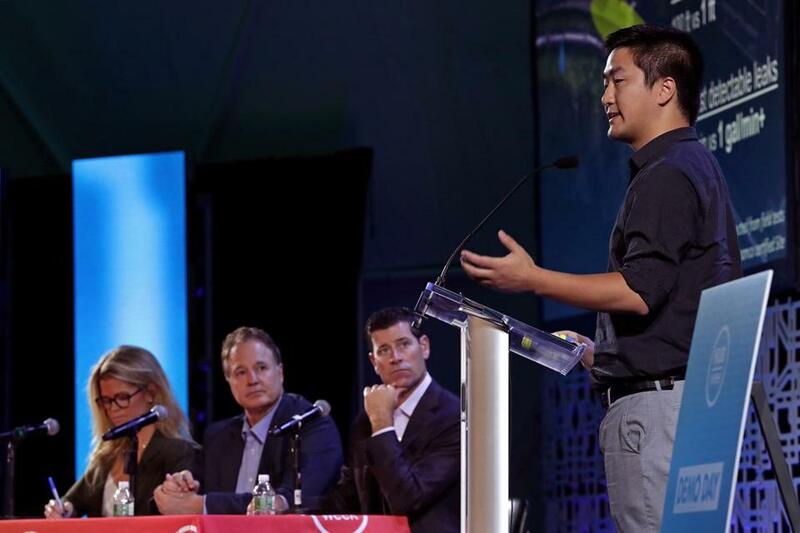 An innovation-themed festival now in its third year, HUBweek was founded by Harvard, MIT, Massachusetts General Hospital, and The Boston Globe. HUBweek wraps up Sunday with a host of events, including a “Robot Block Party” at City Hall Plaza from 11 a.m. to 5 p.m., which includes more than 20 robots representing the latest in Massachusetts robotics.